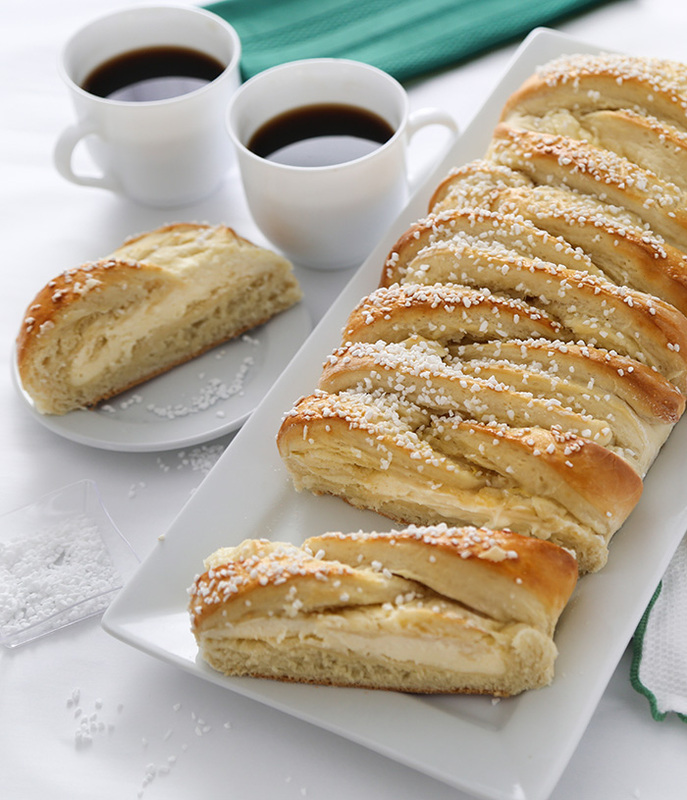 This Danish-style sweet bread makes a lovely breakfast or afternoon pick-me-up. 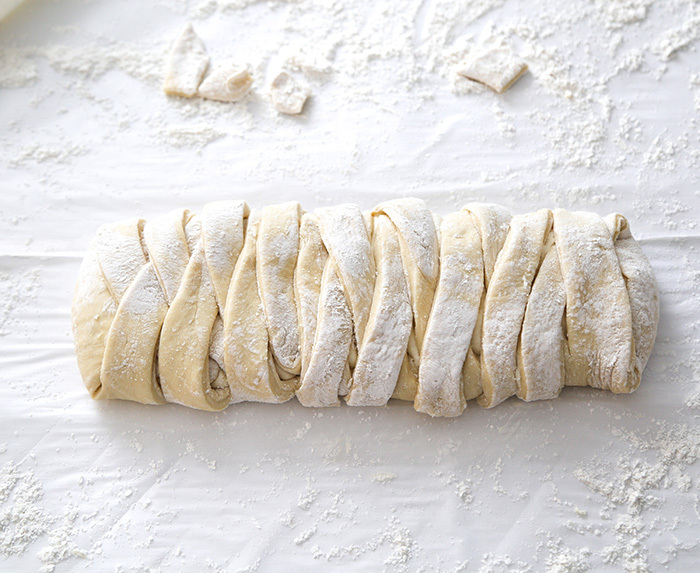 The dough braiding technique may look complicated, but it’s really quite simple and easy to achieve! Winter always brings out the bread baker in me. There's nothing I'd rather do on a frigid day than work in an oven-warmed kitchen with sweet fragrances wafting about. This cream cheese pastry is one of my favorite recipes to make when I feel the need for something cozy. It yields two loaves, one to keep and one to give to a deserving friend or neighbor. The buttery yeast dough is rather simple to put together and it will need to rise until doubled in size (about 45 minutes). 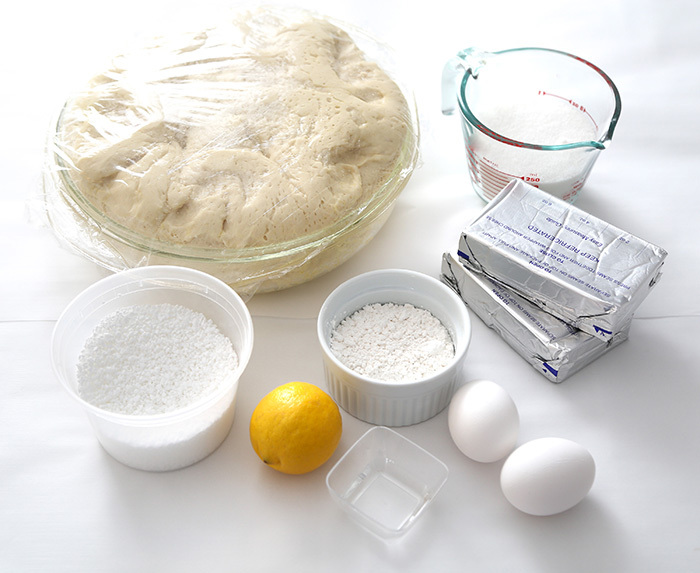 Once the dough is left to rise, I recommend setting out the cream cheese and eggs if they have been refrigerated. They'll be room temperature by the time the dough is ready to be shaped. 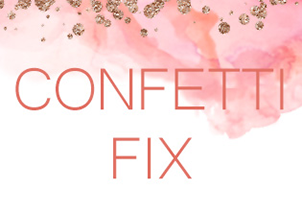 Also, have the filling ingredients mixed before you turn out the dough. 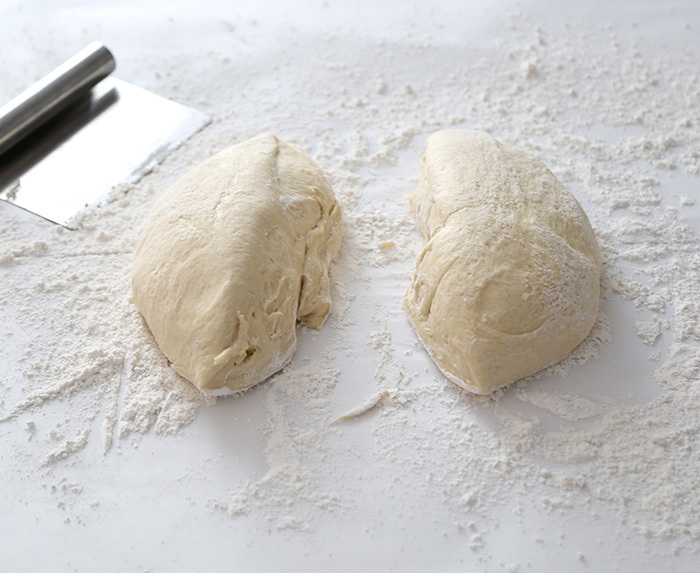 When the dough is well-puffed, punch it down and divide into two equal pieces. 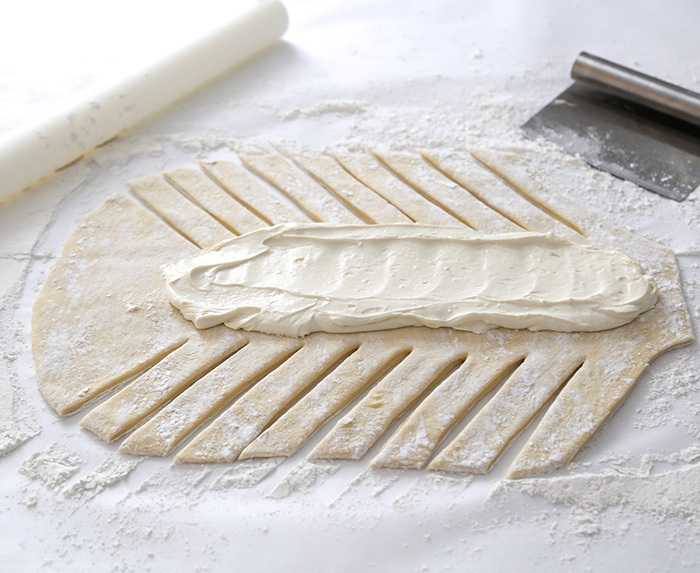 Roll each dough piece roughly to 10x15-inch rectangles. Spread half of the filling lengthwise down the center third of each rectangle. 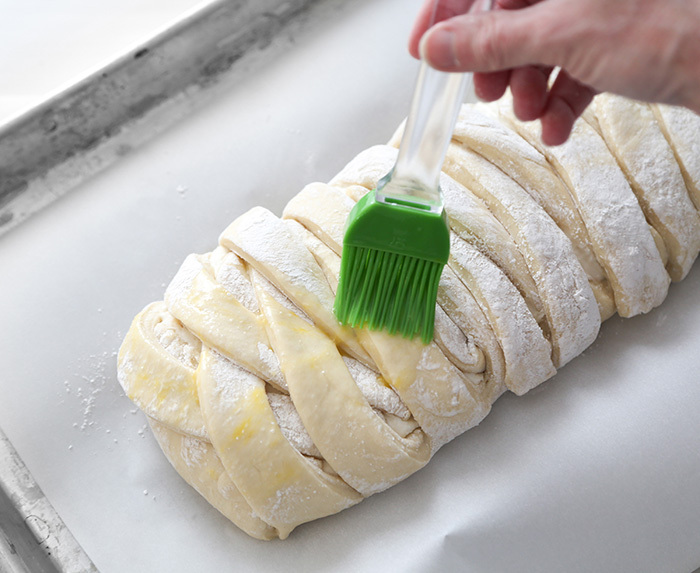 Cut 1-inch wide strips from each side of the filling out to the edges of the dough. Angle the slices slightly as you cut, and trim one end to a slight point. Fold the dough over the filling at each end, and then fold strips at an angle across the filling, alternating from side-to-side. Egg wash will help the pastries bake to golden perfection. 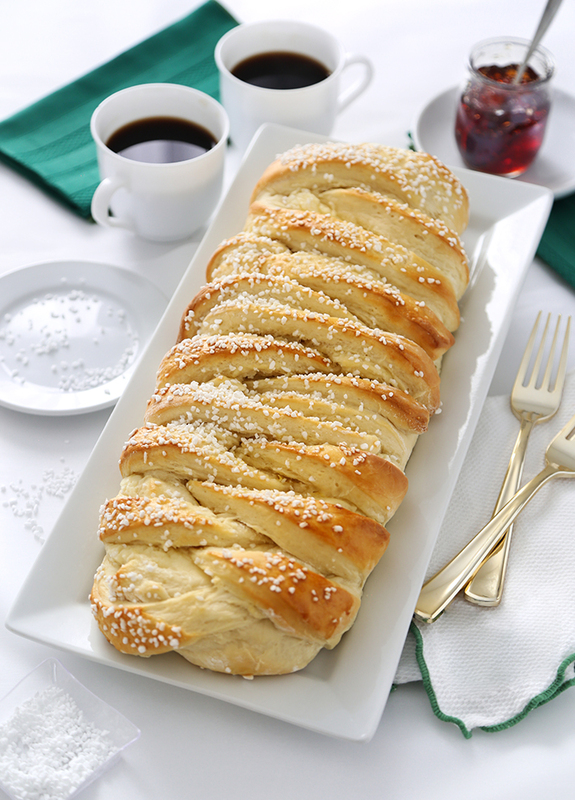 Swedish pearl sugar will give the bread just a little extra sweetness and crunch. 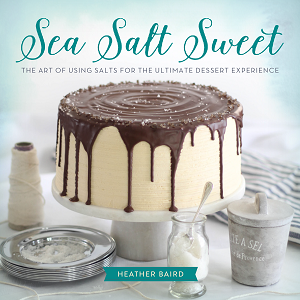 Coarse sugar would also work if you don't have the pearl sugar on hand. 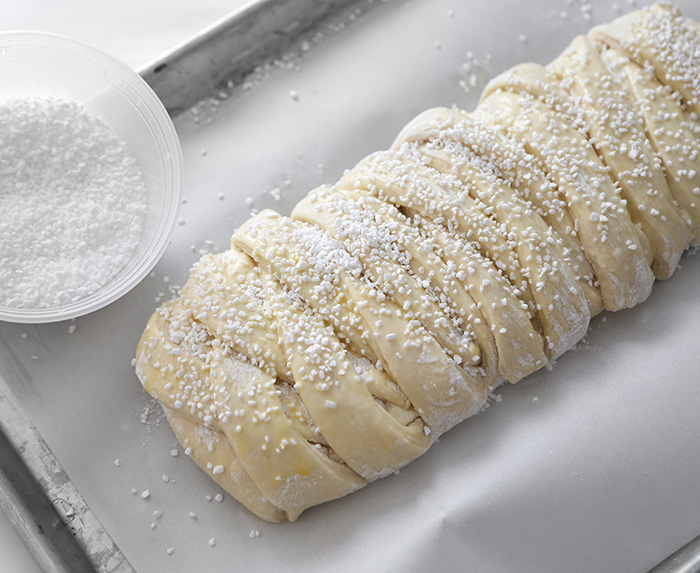 The sliced pastry will reveal the thick ribbon of cream cheese in the center. SO GOOD! 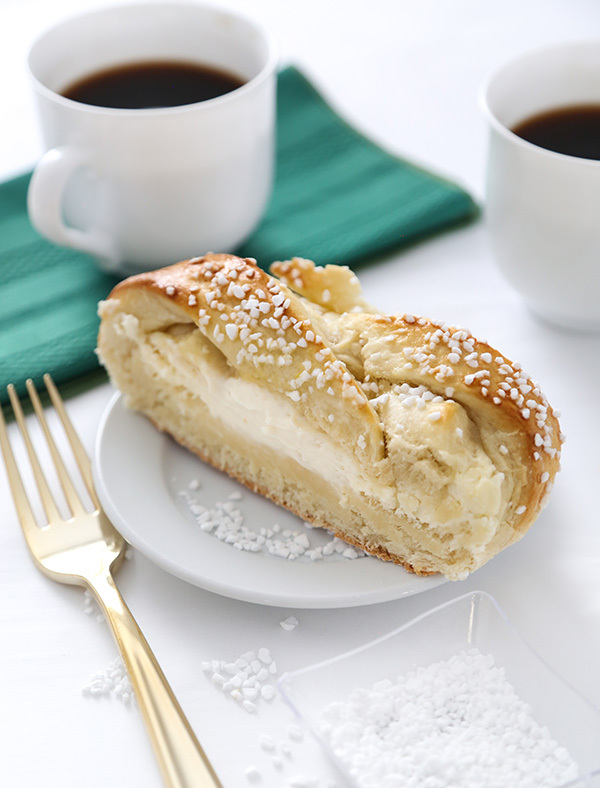 These pastries are absolutely delicious as-is, but if you're craving a fruit-filled danish, you can place dollops of your favorite preserves on top of the cream cheese filling before you braid and bake. This recipe was developed using real butter and dairy for the American Butter Institute and their website Go Bold With Butter! 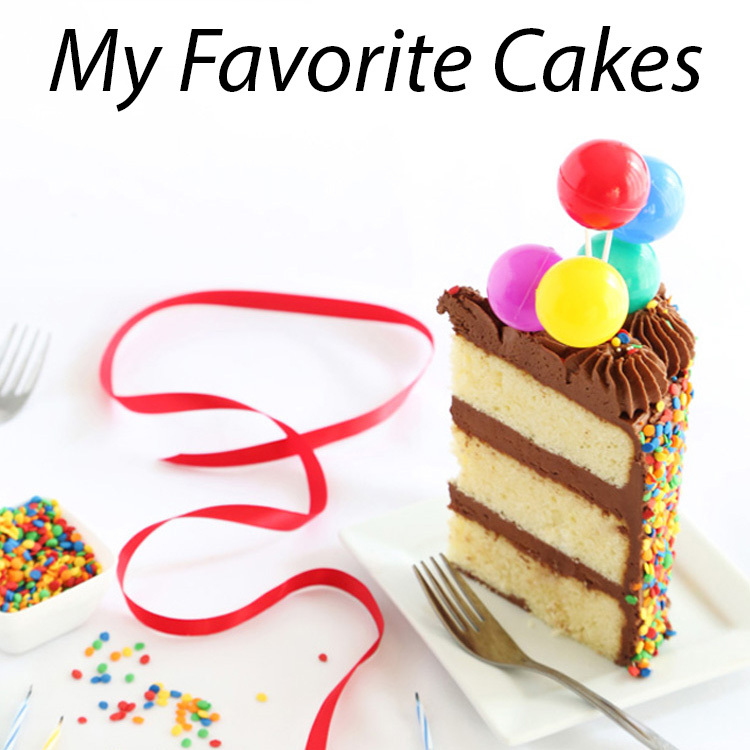 Click here for the printable recipe, and be sure to check out all of their excellent recipes! Not yet, but I totally will if I ever see them offered! This looks delicious! Any do-ahead thoughts about making this? 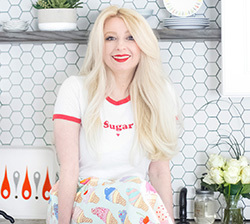 Can it rise overnight then come to room temperature, shape, and bake the next morning? Hi Jeannie! Yes! This dough can be refrigerated overnight. Just as you said, bring to room temperature and shape. OMGosh! How 'sweet' does this braided coffee cake look!! In my town no store carries braided sweet breads and I sure do miss them. But now I can make ours, yay!! I plan on make it this weekend, as soon as I gather the rest of my missing ingredients from my Thursday grocery run. Have a nice day Heather! I made one braid as written and changed the filling to coconut for the second braid (shredded coconut and coconut extract). I made the mistake of rolling the first braid too thin and had some sploogie but the second braid was perfect. Thanks Heather! 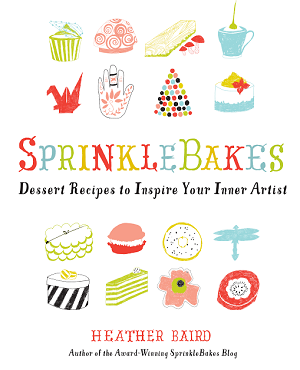 Hi Heather, My braids came out perfectly but I was wondering they can be frozen after baking. They are pretty large but I'm not sure they will last too long anyway. Do these need to be refrigerated after cooling?? My daughter is making them for a baking competition at school and I don't know if they will have refrigerators available for storage. We did a practice run last night and had some oozing of filling on the sides - do you think the dough was too thin in places? Delicious by the way!